The way we work has evolved beyond recognition over the past decade and consequently, office design has had to adapt and create workplaces that support new concepts such as agile working. Increasingly companies are looking to implement new ways of working that can have a positive impact on collaboration, creativity, staff retention, wellbeing and ultimately productivity. There is also a requirement to optimise space usage as companies strive to reduce their physical footprint to counter rising rents and rates. As a result, concepts like agile working and activity based working (ABW) have proven popular and have spread across the globe at a remarkable speed, as they allow companies to make better use of and optimise existing spaces. Added to that, there is a growing realisation and acceptance that the workplace is now essentially a mix of three core elements – people, place and technology, with technology identified as a key driver for change. While the people and place elements aren’t likely to change in the foreseeable future, technology has enabled a greater degree of flexibility and allowed staff to work from anywhere with WiFi connectivity. This increased flexibility has led to a fundamental change in not only how we work, where we work but also how the modern workplace looks, feels and is designed. So, what exactly is agile working? why are companies adopting it? and where does office design fit into the mix? Agile working as a concept has various definitions but simply put it revolves around empowering staff to work where, when and how they choose, with maximum flexibility and access to the necessary tools and technology enabling them to perform at an optimum level. Employees in an agile working environment are typically not constrained by the traditional 9-5 work environment, and are proactively encouraged to work remotely or to utilise the various work settings located within their physical workplace. This approach centers around a focus on performance and outcomes and not presentee-ism and has been proven in many cases to result in increased staff collaboration, improved workplace wellbeing and greater overall productivity and staff retention. Work also becomes an activity rather than a place, that can be completed anywhere the individual chooses, and removes the necessity of having a dedicated desk for all staff. This of course has a major impact on the size of space required by companies and becomes a key driver and motivating factor when opting to adopt agile working. So instead of having a large open plan workspace with seating for all staff, an organisation can optimise its workplace and reduce costs by converting this into shared spaces that staff can use as required. While the benefits of agile working are obvious, it isn’t a solution that companies can simply choose. Fostering an agile working culture and mindset amongst staff can take time. Change is difficult and it is imperative that staff are involved in the journey towards adopting agile working practices. It is not a one size fits all concept, and it will vary from company to company and a proactive consultative and change management approach can make all the difference. Agile working is all about creating a flexible and productive environment, so office design must focus on integrating that flexibility via a variety of work settings and ensuring staff have the complete freedom and flexibility to work where they want, when they want. But how is that possible and where do designers start? The first step in any office design project is to work with the client to properly define the brief and to really drill down into what they need to create their ideal workplace. Where a new way of working like agile working is being adopted, it is imperative that staff are brought on that journey, and that their views and feedback are incorporated into the brief and subsequent office design. Change can be difficult but when staff feel that they are part of the process and that their views are being listened to, the process can be a far more harmonious one. Feedback can be gathered via individual interviews, town hall style team meetings, focus groups and also observations studies which provide designers with an insight into how existing space is actually used. The data can serve to highlight how much time is spent away from the desk, how often meeting rooms are actually used through to where staff eat lunch. Along with the qualitative feedback, it can then be analysed and recommendations regarding layout, space planning and office design are put forward as a result. The goal for the office design team is to create a space that provides the right amount, type and variety of spaces, from concentration pods, meeting booths and tall tables, and also to ensure there is more opportunity for engagement, staff interaction and chance encounters that lead to the elusive water cooler moments. 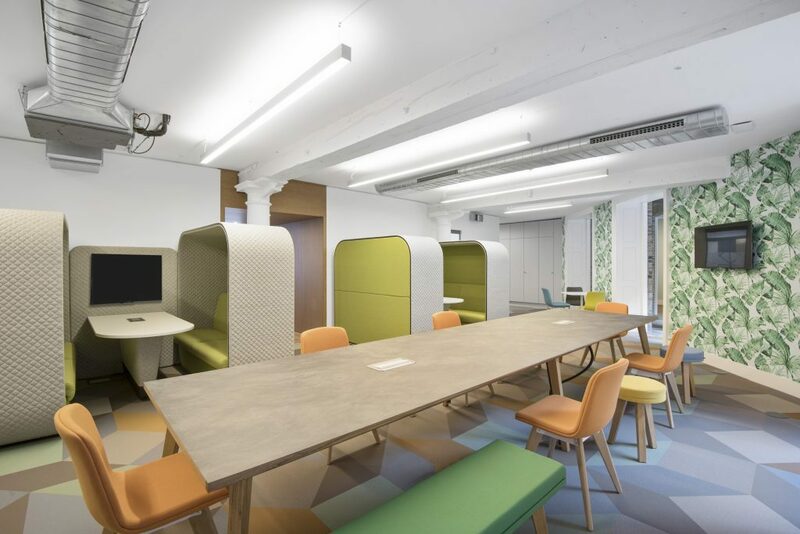 It has also become popular to make use of previously ignored nooks and crannies which have become informal meeting booths or areas where staff can simply relax and unwind. Flexibility is also of paramount importance as agile work environments should have the ability to reconfigure themselves according to how they want to work. The needs of your users may change over time so think about investing in multi-purpose workstations consisting of modular office furniture that can be moved, stacked, and assembled allowing for a large number of configurations, depending on the user or team working on a particular project. The workplace, agile working and office design will continue to evolve over time and it will be fascinating to see how the workplace will look in 10 years and what technology we will be using then – remember 10 years ago 3G wasn’t even a thing, fax machines were on the wane but still active and the idea of working remotely from home or a coffee shop wasn’t the viable option it has become.